The Scale or Gauge of is or should be one of a modellers main considerations when thinking about investing in the hobby. True there are other things to think about; like location, time period and even things like method of control. But the gauge that you as a modeller choose will generally dictate the size and type of layout that will be built and also how far your money will go. There is a dazzling amount of different gauges but I’m going to look at the big three within the UK; these being O, OO and N. These gauges tend to be the best supported by manufacturers and suppliers. 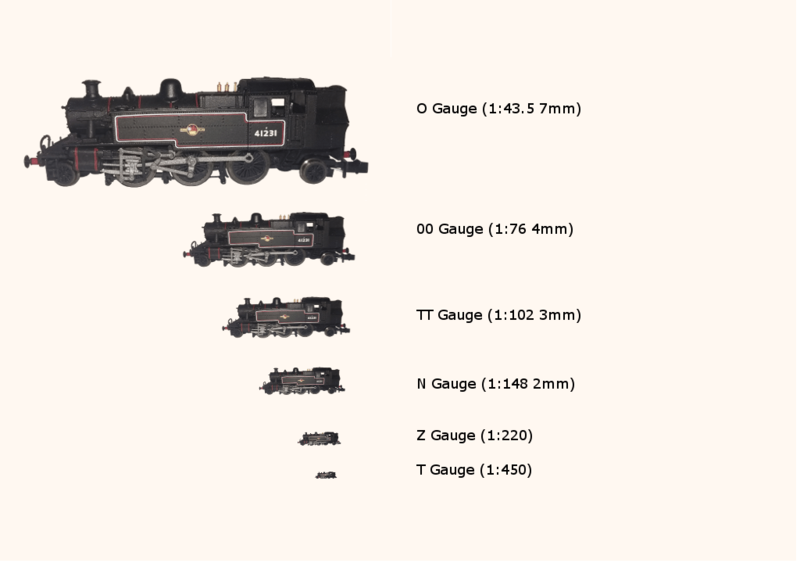 The image below isn’t to scale but should give some idea of the differences is size between gauges. O gauge is the largest of the three, also unsurprisingly the most expensive to buy. A lot of modellers build garden railways at this scale but I have seen some very good micro layouts as well. OO is the most common gauge in use within the UK (Continental and US have HO) and is the scale that people are familiar with as this is the “Hornby” scale. Between the three OO is the “Cheapest”. N is the smallest gauge and the second most popular scale in the UK. Models tend to be more expensive than OO but cheaper than O. Being half the size of OO, layouts usually are either smaller or have capacity for larger trains and scenery. TT, Z and T. I’ve included these more for information, TT is a halfway house between OO and N but does not have the manufacturer support for UK outline models, Z and T are super small and again there is not much in the way of support for UK ready to roll models either. There is no right or wrong way. There are modellers who collect different gauges either changing over time or even collecting at the same time! Most people start off with OO In my case I had a OO layout as a teenager but when I came back to the hobby I started with N simply because I didn’t have the space for anything else. What if you find you started with the wrong gauge? Don’t panic, look at what the issue is and see if there is a way around with the stock you have already invested in, if not there is always eBay. But try not t o get to that point. All I can advise here is choose carefully, try to get a look at the scale you want work with either at an exhibition (ours is on the 11th and 12th of March, see the exhibition page) or in the local model shop. If you are still unsure contact your local club and trawl the web. « Is it a Train Set?